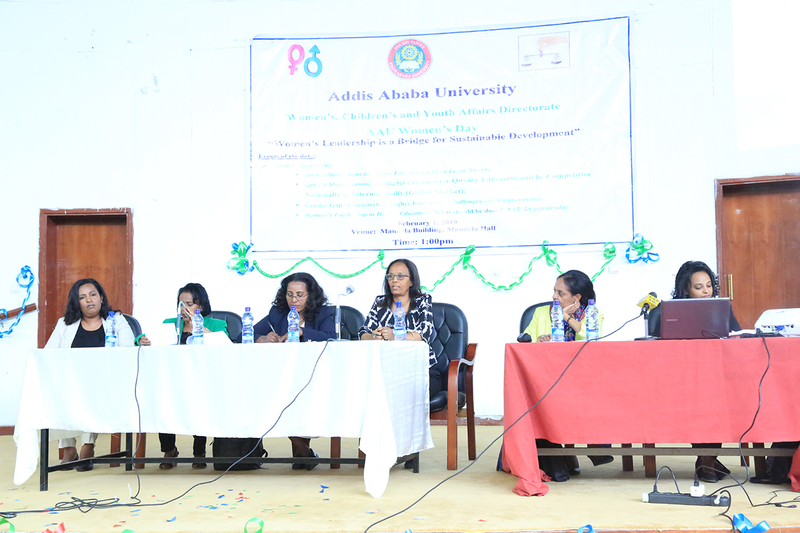 Addis Ababa University Women’s, Children’s and Youth Affairs Office celebrated Addis Ababa University Women’s Day with a panel discussion themed “women’s leadership is a bridge for sustainable development” on February 1, 2019 at Nelson Mandela Hall. Prof. Tassew Woldehana, president of Addis Ababa University in his opening remarks noted that without the involvement of females it is impossible to bring sustainable development in our country because of that since its establishment AAU has been making tremendous effort in the formation of vibrant and active females that are equally participant with males. During the previous years, said the president, to support female students and staffs, AAU opened a gender office at director level; recently to give a better service the office changed its name to Addis Ababa University Women’s, Children’s and Youth Affairs Office. “To support and encourage females, AAU included AAU’s women’s Day in its academic calendar to be celebrated as a holiday every year,” said said Prof. Tassew. Prof. Tassew went on saying that to create effective and capable female students, AAU gives post graduate scholarship for more than 200 students every year. Our female researchers and academic staff were not more than 15%; to encourage and increase their number, the university has taken affirmative action and gave 10% of the total budget allocated for researches for females to do their research activities. In addition, the university also selects top female graduates and gives post graduate programs to be an academic staffs. 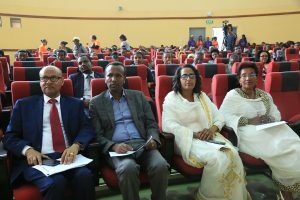 The university is further working diligently, said Prof. Tassew, to increase number of female leaders citing the newly assigned women as Vice President for Research and Technology Transfer Office, Mitike Molla (PhD). The ceremony also featured scientific paper presentation. Various researchers presented their research papers on sexual harassment in higher education and its legal aspects; gender mainstreaming in higher education for quality education and be competitive nationally and internationally (Global Market); gender gap in research in higher education challenges and opportunities; women leadership in higher education: what should be done. On this program the AAU president, Prof. Tassew, gave certificate of recognition for different organizations and peoples who supported the office directly or indirectly among others, Prof Yalemtsehay Mekonnen from College of Natural and Computational Sciences, Aster Zewede memorial Fund, Wr/o Nigist Engadashet, Hemen Mother’s and Children’s Specialty Medical Center and AAU’s Yellow Movement Club.